My biggest and most important Christmas wish was two years ago – and it actually came true. My husband and I were approved adopters and could not wait to welcome a new Aussie into our home. It was just a matter of finding the best fit for the dog and for us. We finally saw Mollie’s smiling face on the BARK website and immediately we knew she was special. A couple weeks before Thanksgiving, we adopted her and it was the best decision we’ve ever made. The holidays that year were extra special, and we enjoyed bonding with Mollie during our time off and making her feel welcome and loved in her new home. • Make sure the time is right. The holidays can be some of the busiest days of the year and you want to be sure you have enough time to devote to your new friend. If you plan to go out of town or have other commitments, you may wish to wait until after the New Year. • Make the decision to adopt as a family. While a new dog seems like a great gift idea, it’s a lifetime commitment and one that should be taken seriously. All family members should be on board. • You’ll want to spend plenty of time with your new family member when they join your home. This is an important bonding time for you, other family members or pets in the home and your dog. You’ll want to make your new pet feel extra special and get to know them! 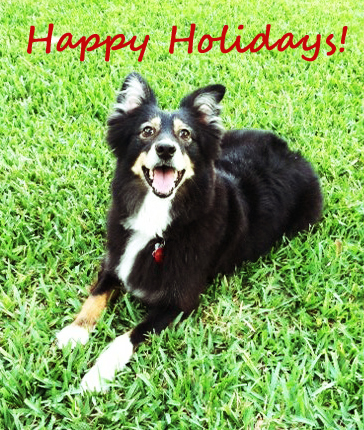 The holidays can be a great time to adopt an Aussie, especially if you have time off from work or have extra downtime. You and your newly adopted dog can enjoy walks, getting used to the neighborhood, doing some training and unwinding together. Remember, this is a time of great change for your Aussie. Everything is new for them – their home, family members and possibly even a new state and climate! If you’re ready for adoption, the holidays may be a wonderful time to welcome a new friend. Just think – not only are you adding love and warmth to your home, but you are also giving a rescued animal a forever family. What’s a better way to celebrate the holidays?